The most primitive short-tailed bird? Back in the day when I was a postdoc at the University of Bristol I was involved in a project to build the first supertree for non-avian dinosaurs (Pisani et al. 2002). Now our initial efforts have been thoroughly superseded by a new supertree created by a new team, also from Bristol, headed up by Graeme Lloyd. What is a supertree? 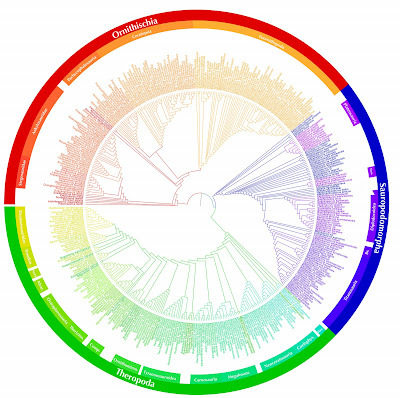 Basically its a very large phylogenetic tree stitched together from smaller trees made from standard cladistic analyses of a feasible size (known as source trees). This might, at first, sound like a trivial operation but when you have partially overlapping sets of taxa in the source trees it quickly becomes a calculatory nightmare to produce a rigorous consensus of the source trees. About the only feasible solution available then (and probably still now) was Matrix Representation using Parsimony, or MRP for short. In this technique each node in each tree was treated as a character and all of the ingroup members of that node are coded as '1' whereas all outgroup members are coded as '0'. Taxa that don't appear in that particular source tree are given a '?'. In effect the 'winning' signal from each analysis has all competing signals stripped away and then is combined with all the other 'winning' signals from the other source trees. A large matrix is thus compiled and can be analysed using standard parsimony-based techniques. Some of the early practitioners of supertrees got quite carried away with this and thought that by combining all these small sub-signals together a new signal, perhaps more closely approximating the truth than any other, was created. I lampooned this point of view at SVP with the slide: "Supertrees - a marvelous new way of generating new, more inclusive phylogenies without all that tedious mucking about with actual specimens" (Hat tip to the comic genius of Douglas Adams). No, in my view, supertrees should only be used as a consensus technique to form baseline phylogenies for other studies. It is good to see that that is how the supertree is used in the Lloyd et al. paper. So what did they use their supertree for? The supertree was used to look at the evolution of dinosaur diversity through time. Unsuprisingly they found that raw diversity was strongly affected by sampling bias. Crudely put there are a lot of Late Cretaceous Dinosaurs because there are a lot of late Cretaceous rocks and a lot of man-hours have been spent collecting from them. Perhaps a little more surprising is the find that after a initial burst of adaptive radiation, dinosaur diversification proceeded at a fairly steady pace throughout the Mesozoic and did not appear to change during the KTR (Cretaceous Terrestrial Revolution) where modern ecosystems were forged by the explosive radiation of flowering plants, insects and numerous other modern groups. Hi Adam, thanks for the propaganda! Oddly enough in my post I missed the opportunity of poiting out other things that can be done with trees - like my Cope'S rule paper based o the Mk 1 tree I wrote with Davide!